Wisdom, the 68-year-old albatross, has still got it going on. Here she is incubating her egg this week at the Midway Atoll National Wildlife Refuge. The world's oldest known wild bird, a Laysan albatross that is at least 68 years old, has laid another egg. 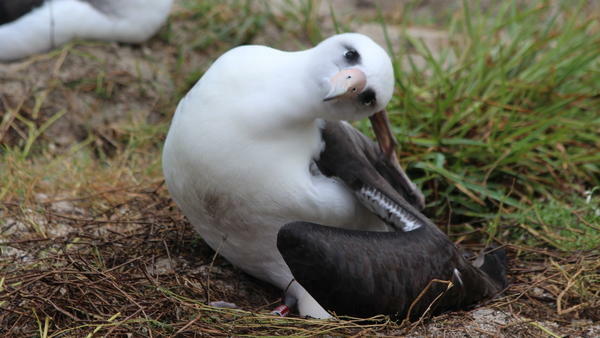 Wisdom, who returns each year to Midway Atoll to nest, was seen back at her favorite nest site in late November, and biologists at Midway Atoll National Wildlife Refuge have confirmed she's brooding. The remarkable albatross is believed to have laid nearly 40 eggs over the course of her life, although it's impossible to know the precise number. She has single-wingedly transformed scientists' understanding of albatross lifespans and the age limits on avian reproduction. The bird is "a world renowned symbol of hope for all species that depend upon the health of the ocean to survive," according to the Fish and Wildlife Service. Wisdom is not just continuing to procreate — she's doing it at an impressive clip, too. Many albatrosses take a year off between eggs because the process of laying and incubating an egg is so energy-intensive. But every year since 2006, Wisdom and her current mate, Akeakamai, have laid an egg at the same nest in Midway Atoll. When not raising their young there, Wisdom and Akeakamai are world travelers. Albatrosses are renowned long-distance fliers, capable of soaring thousands of miles almost without even flapping their massive wings, more than 6 feet across. As NPR has previously reported, Wisdom has probably flown more than 3 million miles over the past six decades — far enough to fly to the moon and back six times. The birds find food on the surface of the ocean, mostly at night. "They feed on anything that floats on the surface of the water; squid, fish, crustaceans and flying fish eggs," the Fish and Wildlife Service writes. "Unfortunately, this includes marine debris as well; with an estimated 5 tons of plastic that was mistaken for floating fish eggs or squid being fed to chicks each year." Wisdom was first banded by biologist Chandler Robbins in 1956, along with thousands of other albatrosses. At the time, she was already mature, or older than 5 years old. That means we know Wisdom is at least 68 — but she could easily be even older than that. Wisdom carried Robbins' band around the globe for decades. Then, astonishingly, the biologist and the bird were reunited in 2002, when Robbins returned to Midway to research albatrosses again. He rebanded Wisdom and, checking the detailed band records, discovered he had placed her original band there 46 years before. In 2006, U.S. Fish and Wildlife Service staff located Wisdom again and gave her yet another band, this one designed to make her easier to spot for monitoring. Since then, the FWS has kept a close eye on Wisdom. In 2011, Wisdom survived a tsunami that crashed into Midway Atoll and killed thousands of birds. In 2015, Wisdom and Akeakamai lost an egg, possibly due to predators, but the couple successfully hatched chicks again in 2016, 2017 and February of this year. Albatrosses lay just one egg at a time. Eggs take two months to hatch, and the chicks live at the nest for five months before they are ready to live on their own. During that time, mother and father alternate between nest duty and food foraging. Akeakamai, by the way, means "lover of wisdom." And albatrosses mate for life, though it appears that Wisdom outlived at least one partner before Akeakamai.